Welcome to the Myanmar morning news roundup by AEC News Today, your one stop for Myanmar news on matters of governance and policies affecting Asean business communities. Around 600 people in Myanmar’s restive Rakhine state have protested a government decision to give 53 Muslims official identification cards, saying the move was illegal. Concluding a four-day visit to parts of Bangladesh where she met with members of Myanmar’s Rohingya community who fled the violence there following attacks on a border post in early October and the ensuing military operations, a United Nations expert called for urgent action by the Government of Myanmar to end the suffering of the Rohingya population in the country. The Central Bank of Myanmar will no longer fix the reference rates for currency exchange, said its vice-governor Set Aung. Union Minister for Finance and Planning Kyaw Win said the ministry will step up its efforts to crackdown on illegal trade at check points starting in March. The Ministry of Planning and Finance has issued a statement on February 19 that income tax will not be levied on interest from bank savings and deposits. The statement means that tax on interest from bank deposits will be exempted in the coming 2017-18 fiscal year. Myanmar is in the midst of extremely tumultuous times caused by a quick jump to representative democracy coupled with a slew of historical problems. At times, such multifaceted concerns have put the Southeast Asian country’s government at odds with that of its largest trade partner and longtime benefactor. The newest incident — the destruction of property and brief detainment of Chinese nationals in Yangon — highlights simmering anger in Myanmar over China’s influence in the country. The Government of Myanmar has set up a new committee, replacing an existing body, to study and revise the minimum wage in the country. The current minimum wage of K3,600 per day was set by the previous government in September 2015. The new committee includes financial experts, ministries and representatives from labour and employer groups. Two craft beer lovers have made beer history by opening the country’s first microbrewery, breaking into an industry dominated by the military, foreign corporations and a single, wealthy family. A telecommunications tower enterprise has become the first company to voluntarily submit to a corporate transparency survey founded by the Myanmar Centre for Responsible Business, scoring highly against some of the country’s most recognised firms. Special Assistant to Prime Minister on Foreign Affairs Syed Tariq Fatemi has underscored the need to further develop relations between Pakistan and Myanmar. Vietnamese IT giant FPT Corporation has been selected by Myanmar to implement a 11.3 million USD project that is part of a programme to modernise the nation’s public finance system. Yangon Book Plaza, the first of its kind in Myanmar, accommodating book stalls, publishing houses, booths of famous writers, recreation centres and cafes, was opened on the fifth floor of Than Market (China town) on Lanmadaw Township, on February 26. Disabled persons in wheelchairs advocating peace in Myanmar reached their destination in Nay Pyi Taw today (February 28). Seven non-signatory armed ethnic groups to the Nationwide Ceasefire Agreement (NCA) have called for a new peace process, saying the current NCA-based process is ineffective. More research into ways of improving public health is required in Chin State, says the national Minister of health and Sports, Myint Htwe. About 300 workers from industrial zones in Shwepyitha and Hlaingthaya staged a protest outside City Hall in Yangon on Sunday. 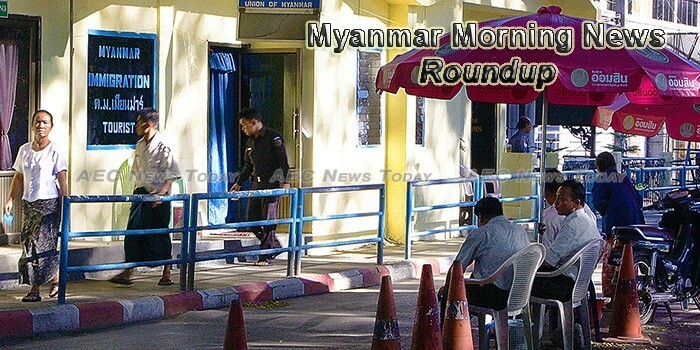 The Myanmar morning news roundup is published M-F by AEC News Today: Governance, not government; policies not politics.